With clear blue water beneath you and eye-popping coastal scenery around you, sitting on top of a kayak is a pretty idyllic place to be. Here’s our insider’s guide to the best kayaking spots in Cornwall. Prepare to be blown away. We’ve got to start with our homeland. At Towan beach everything aligns in spectacular style. The golden sands, the bluest of waters, the incredible wildlife and the impossibly beautiful craggy cliffs packed with secret beaches, fascinating history and hidden caves. This is where kayaking gets super special and where no two paddles are the same. In fact Kayaking at Towan is perfect for repeat visits due to the large tidal range, every trip is vastly different. 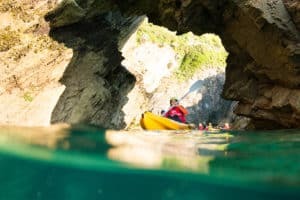 Spring and Neap tides change the dynamic of the journey in so many ways and caves will become available to paddle into and marine life that can only be seen at low tides will become visible. 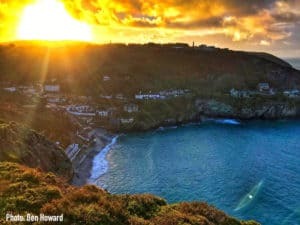 From the shallows of Towan Beach and with the big, open waters beckoning, paddle out of the bay to the Gazzle, a 2km stretch of Atlantic coastline where tales of piracy and shipwrecks abound. The Gazzle is the home of Coasteering in the region so your kayak session will usually pass one or more groups traversing along the cliffs or jumping in from various heights. Using a kayak allows groups to move faster along the coastline so by adding a Coasteer to your trip allows you to explore more areas on the Gazzle and find more of those adrenaline pumping jumps and sluice rides that are synonymous with Coasteering in the region. The Gazzle is teaming with marine wildlife and unique features, here the kayak becomes a unique viewing platform into the underwater world below. Glide along the ocean surface and keep your eyes peeled because you’re guaranteed to encounter an array of marine wildlife, as rich and diverse as any coastline in the world. Large populations of resident cormorants and great northern divers can be seen fishing the waters throughout the year, and migrant wonders such as manx shearwater and puffins are not uncommon. This part of the coast is also home to one of the last remaining kittiwake nesting sites in the south-west, a rare honour to host a bird now RED listed under the RSPB’s conservation status. Just a short time spent in these waters will almost certainly bring the intrepid into contact with one of the Cornish coast’s most charismatic creatures: The Grey Seal. Over a third of the entire world’s grey seal population can be found in UK waters, many of which make their home in Cornwall, and the Gazzel is a regular haunt for grey seals hunting. Though always best enjoyed from a distance, their curious disposition can make for some intimate encounters, and memorable experiences. To top it all off, this stretch of coast is routinely visited by pods of larger marine mammals. Common and bottlenose dolphins, harbour porpoise, and even whales have all been spotted from land and sea, collectively making Towan one of the most enticing prospects for wildlife in Cornwall and beyond. For a more adrenaline orientated adventure then make sure you go when there is a bit of swell. The paddle out becomes a challenge to get over the oncoming waves and out past the break and the paddle in becomes a kayak surf which will get the heart racing. On the journey, there are many different iconic venues that you must see. From the famous island house with its 90ft suspension bridge to the Harbour and fly cellars used for pilchard fishing during the 19th century and also for smugglers to store china tea, brandy, wine and silk. Moving further round the headland will take you to the old lifeboat slip which was once one of the steepest slipways in Europe. This is the scene of one of Newquay’s most famous rescue attempts by the Lifeboat in 1917 to rescue the upturned Osten. This resulted in the crew being caught out by the huge swell and having to survive for 3 days in the Tea Caverns cave which you can paddle into. Once past the slipway you will then encounter the mighty Cribbar Reef. Whilst completely flat for most of the year, during the winter swell season its home to Newquay’s big wave surf spot where you can see waves in excess of 30feet. 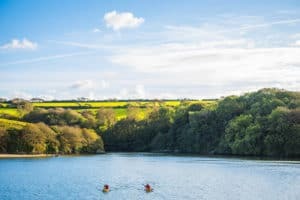 With the amount that Towan Beach has to offer, it is easy to see why this has become one of the most popular kayaking venues in all of Cornwall. Fancy a chilled paddle where the mood is peaceful, the conditions are lagoon-like and the vibe one of mindfulness and calm? The stillness of the Gannel Estuary is just the ticket. This is where you can relax, catch your breath and take in the surroundings. 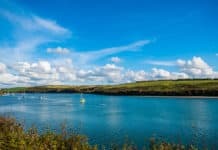 From the mystical overhanging trees of Penpol Creek with its fun rope swings to the hidden water inlets and abundant wildlife, the Gannel Estuary sitting in the shadow of Towan Headland and Crantock Beach, is a little piece of kayaking heaven and also a dream venue for Stand Up Paddleboarders. 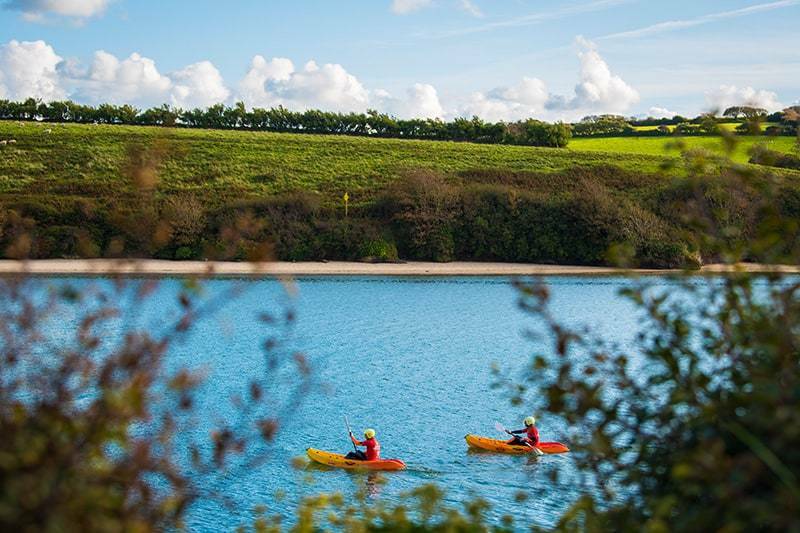 The Gannel is the perfect place to learn all of your necessary kayaking skills in a relatively safe environment whilst still being able to take in the scenery and wildlife. Best explored at dawn or dusk when the spring tides are at their biggest, keep your eyes peeled for an array of birdlife. At low tides this estuary becomes a twitcher’s paradise, where wading birds from the pedestrian to exotic have been known to plunder the sand for burrowing creatures. Common sights include the peculiar curved beaks of Curlew and Whimbrel, distinctive blue flash of Kingfishers, and brilliant white feathers of Little and Cattle Egrets. 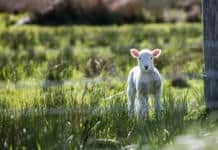 Visitors here shift with the seasons and are as reliable as the overwintering of wetland ducks like Wigeon and Teal, or as rare as surprise stopovers from distant travellers such as Dalmatian Pelican, occasionally losing their way on migratory flights. Those with an interest in the uncanny may wish to seek out the ghostly presence known to locals as ‘The Gannel Crake’, whose chilling call can be heard in the twilight hours. Whether the cry of a tortured soul, or call of an unknown bird, the Crake contributes to an area of natural beauty that is a true jewel in Newquay’s crown. The Gannel’s recent classification as a Marine Conservation Zone (MCZ) means this location and its abundant wildlife will be preserved for generations to come. There’s various types of Plover to Greenshanks, little Egret and Godwit to spot and if you fancy trying your luck at fishing you might just catch a school Bass or small Mullet (please be aware of the strict catch and release policy). And if you like your paddle with a side helping of heritage take in the remnants of an Iron Age Village and the remains of an old quay and lime kiln which hint at the Gannel’s previous life as a busy hub of activity. Check out millionaires row on the Pentire side of the river to view some of the largest and most stunning properties in the area. Don’t forget to stop at the Fern Pit Café and try out some of its amazing sandwiches and cakes. The most ideal time to venture out is an hour and a half either side of High Tide and ideally on a 6m+ tide to really get the most out of this epic kayaking journey. Don’t get caught out as the tide drops quickly as you may find that you have to drag your kayak back to the car. Avoid paddling on the Gannel when the wind is blowing Westerly, Northerly winds are fine though. Launch from Crantock Beach or the small car park that is just off the Gannel link road in Newquay. Oh Porthcurno, Cornwall’s ultimate beauty spot and how we adore you. Rivalling exotic locations from far-flung destinations around the world, Porthcurno is all about crystal waters, fine, golden sand and head turning scenery. There are regular summer visits from Basking Sharks which makes for some epic travelling companions. If you want to make your Instgram grid pop, jump on a kayak here and see the likes come flooding in. The access to the beach can be a little tricky but it is definitely worth the effort and in winter it turns into a great spot for both Surfing and Bodyboarding. For a paddle full of varied interest, the Fowey Estuary could be accused of over delivering. There’s secluded little beaches, hidden inlets, the busy docks and the beauty of arriving at the chic town of Fowey by water. There’s tides and currents to consider but time it right and it’s difficult to get bored on this characterful stretch. The river is nice and wide and meanders around so that there is plenty of places to explore. The added bonus to this little piece of paddling heaven is that you can start right from the car park which limits any carry time….Perfect. For higher adrenaline Kayaking, a move further afield is in order to our neighbouring county of Devon. Here you can find the mellow Lower Dart river or its bigger brother, the Dart Loop. This is a perfect example of classic grade 2 and 3 rivers which will offer the Kayaker a combination of fun, challenging and technical sections. Where are your kayaking hotspots?